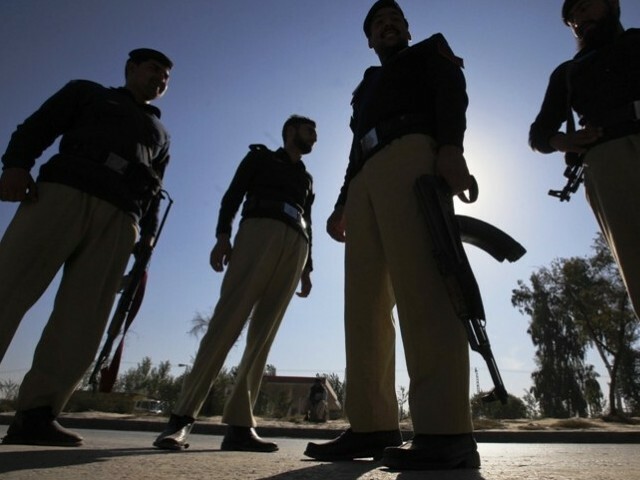 RAWALPINDI: A police officer, who had been killed during a raid on a suspected drug dealer’s den late on Thursday, was laid to rest on Friday. Police have also registered a case of the officer’s murder, including clauses of the anti-terrorism act. ASI Muhammad Riaz, a duty clerk at the Wah Cantonment Police Station, was at the station when the SHO called him. The SHO said that they were going to raid a suspected den of an alleged drug dealer Qaiser Rasheed. However, since they were short of staff, ASI Riaz will accompany them on the raid. In the haste to join the rest of the squad, ASI Riaz forgot his bulletproof vest in the station. Just days before, the police chief had directed all police officers in the province to wear their bulletproof vests at all times with threats that an attack could take place at any moment. When the squad reached Rasheed’s house, they saw him drive up along with his father on a motorbike. At this point, Rasheed’s brother Osama raised the alarm that the police had arrived. At this, the suspected drug dealers allegedly shot at the police squad with a 30 bore handgun. One of the bullets fired struck Riaz in the chest leaving him critically injured. Other officers, though, checked their fire since they were in a crowded area. The assailants, though, dumped around 5.3 kilogrammes of drugs and fled. ASI Riaz was rushed to the Pakistan Ordinance Factory (POF) Hospital in Wah for treatment. The police officer, however, succumbed to his wounds. On Friday morning, his funeral prayers were offered at the Police Lines in Rawalpindi with a number of police and district officials attending including Regional Police Officer Fayyaz Dev, Rawalpindi City Police Officer Abbas Ahsan, Rawalpindi Commissioner Jodat Ayaz, and Rawalpindi Deputy Commissioner Umer Jahangir among others. The police presented ASI Riaz with a ‘guard of honour’ and later his body was handed over to his family. ASI Riaz, a father of five, was then buried in his ancestral graveyard in Gujjar Khan. After the funeral prayers, RPO Dev said that they have arrested a number of renowned drug dealers in recent months. He added that the exercise has taken a heavy toll on the police who had lost another officer earlier while another had been injured. He further claimed that of the suspects involved in the current incident, three were brothers from the same family and had been caught. The man who shot ASI Riaz, though, was still at large. However, RPO Dev assured of early arrest of the main culprit. Commissioner Jodat Ayaz said that the family of the deceased will be provided incentives from the Punjab government as promised. He lamented that the poor economic condition of the country meant that they could not make the necessary resources available for the police department, including the bulletproof vests. He promised to raise the issue of equipping the police with the latest weaponry and safety instruments such as bulletproof jackets with the government. Officers said that cases of murder and attempted murder have been registered against the culprits. The police are conducting raids to apprehend the absconding suspect.